Zadek bowl - 7⅛" (180 mm) wide. Douglas Zadek, born in London in 1913, studied at the Bauhaus. At Bernard Leach's invitation he joined the Leach Pottery in 1936 and stayed there for two years. Zadek founded Cobham Pottery (Surrey Pottery Ltd), which ran from 1947 to 1956. 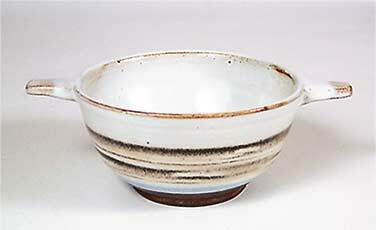 He worked with many distinguished potters and remained good friends with Bernard Leach until Leach's death in 1979. He is best known for his coloured slip decorated earthenware. The Cobham Pottery operated from 1947 to 1956. It was founded and run by Douglas Zadek, friend and ex-colleague of Bernard Leach. Various potters worked with him during the nine years, including Benny Sirota, one of the co-founders of Troika. The earthenware pots were slip decorated in simple attractive designs. Zadek continued to pot after the closure of Cobham Pottery, using his DZ mark.